I often decorate my sacred spaces with red roses...LOVE them...bc I am an insatiable Cancerian wombman, I dry them all to preserve their energy and hang them because I cant just throw 'em out. It's like I connect with them. 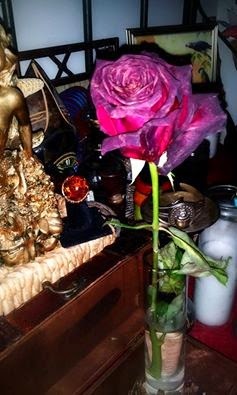 But THIS rose in particular...this special lil' baby has sat atop my prayer alter for over a month now. Many challenges I have been met with over the last few weeks, but God is faithful and all trials are now water under the bridge. But THIS rose in particular...this rose that has sat on my prayer alter dried in its natural state...it did not wilt or succumb to the elements...it is as vibrant and beautiful as the day I placed it there OVER a month ago. Oh, how GOD has spoken to me this day!!! I am that rose...kept and vibrant and beautiful. I shall not wilt under the pressure of life, and remember that I am made perfect and whole in the presence of an Omnipotent, Omniscient and Omnipresent GOD. ASE.